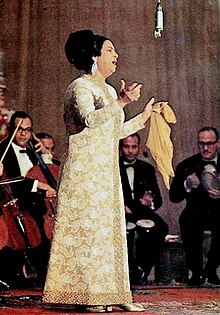 Umm Kulthum (Arabic: أم كلثوم‎ ʾUmm Kulsūm; Arabic pronunciation: [um kulˈθuːm]; born Fātimah ʾIbrāhīm as-Sayyid al-Biltāǧī (فاطمة إبراهيم السيد البلتاجي [ˈfɑtˤmɑ (ʔe)bɾɑˈhiːm esˈsæjjed elbelˈtæːɡi]; see Kunya) on an uncertain date (December 31, 1898, or Mey 4, 1904), dee'd Februar 3, 1975) wis an internaitionally famous Egyptian sangster, sangwriter, an film actress active frae the 1920s tae the 1970s. She was gien the honoureefic teetle Kawkab al-Sharq كوكب الشرق ("Planet o the East") in Arabic. Kent for her extraordinary vocal ability an style, Umm Kulthum wis ane o the greatest an maist influential Arab sangsters o the 20t century. This page wis last eeditit on 26 Mairch 2017, at 16:58.